Scott passed away unexpectedly on December 25, 2018, in his home. Scott was born in Neenah, WI in November of 1965 to Arden and Dorothy (Kohler) Eckstein. Scott took pride as a third generation farmer at his family farm in Larsen. He was an outdoor man that loved hunting and had a passion for raising English Springer Spaniel dogs. He surrounded himself with several dogs he loved. 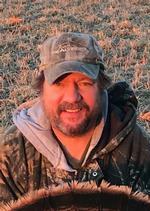 He was a member of many conservation groups including Pheasants Forever, Ducks Unlimited, Whitetails Unlimited, Ruffed Grouse Society, and Trout Unlimited. Scott was a kind and generous man who treated every person as his family. He was always there for people offering a helping hand and an ear to listen. He was the most dependable friend and family member one could ever wish for. Scott is survived by his parents, Arden and Dorothy Eckstein; the mother of his children, Laurie Eckstein; his three children, Kevin, Hailey, and Dillon; his brother, Cary Eckstein; two nieces, Carissa (Jeremy) Fritz, Catie (Chad) Emerson; and one nephew, Craig (Megan) Eckstein. He was preceded in death by his sister-in-law, Cindy Eckstein. A visitation for family and friends will be on Saturday, December 29, 2018, from 9:00 to 11:00 a.m. at Mueller Funeral Home 904 E. Main St. Winneconne. A funeral service will be held on Saturday at 11:00 a.m. at the funeral home with Pastor Connie Bramlett officiating. Burial will follow in the Clayton Cemetery. Our sympathy goes out to the Eckstein family. We are so very sorry to hear about the loss of Scott. He will be missed greatly. RIP Scott. I am a friend Of Kevins. I am so sorry for your loss, for you and your whole family. Praying for comfort. I love you Kev!! Hugs to you all!!! So sorry for your loss! Our prayers are with you and you family! With a heavy heart I pray for God's comfort for your family. Scott will be missed and always loved through memories. Sending you my sympathy on the passing of Scott. So sorry to hear this news. So sorry for your loss.I know how you feel and will be praying for you during this difficult time. God be with you all in this time of sorrow. Sending prayers of comfort and strength to your family in this time of loss. So sorry to hear this. God Bless all of you. Your are in our thoughts and prayers. We are so sorry for your loss. We are praying for you during this difficult time.